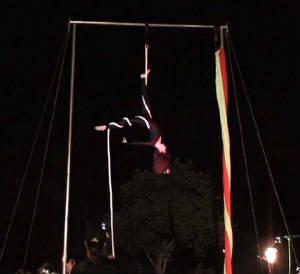 These are my needs for aerial and fire performances- each event is different and some of these needs I can provide for an additional charge such as a portable aerial rig, fire safety personel etc. 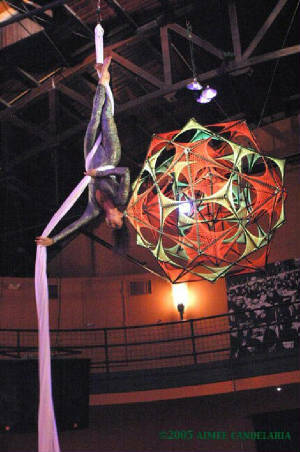 Feel free to call with questions as I know this is one of the trickier parts of setting up an aerial or fire performance. Safety is the priority!!! 1). A Support Beam or Drop Points that can hold 1000 lbs. (The drops I do greatly increase the weight load). The aerial silk or rope anchors to just one point- I have everything I need to wrap around a beam or hook up to a drop point. 2).A Height of 18 - 30 ft. for silks or rope. I need to know the exact height ahead of time to bring the proper spansets, etc. 3). A Clear area of 6 feet surrounding the silk or rope in all directions from floor to ceiling. And someone or a barrier to make sure no one walks underneath the performance area. 4).A safe way to get up to the drop point or beam to rig such as a lift. 5). A quiet, solitary place to keep warm, stretch, warm-up, and get into costume and make-up for the 2-3 hours proceeding my performance, and during the time between acts. 6).A good sound system and someone to play my c.d. 7).Good lighting that goes all the way up the silk or rope, and someone to work the lights. 8). Water and healthy snacks such as nuts, fruit, or green salad. 3)A peformance area of at least 10 feet wide and 15 feet deep.